Find out why the proper diagnosis is critical to remediation. Once the root problems are remediated, then the child/individual will have the tools he/she need to be successful in academics. For the older child/adult, once those Processing Problems are remediated he/she will still need to learn the skills to master phonics, reading, writing, mathematics and studying. Merritt Speech & Learning specializes in the diagnosis and treatment of communication disorders and processing disorders. A complete Auditory Processing & Visual Processing Screening at Merritt Speech & Learning can clearly delineate the problem. Acuity and Processing in both the auditory and visual domains will be thoroughly screened. At that time, a plan will be made to remediate the problems. 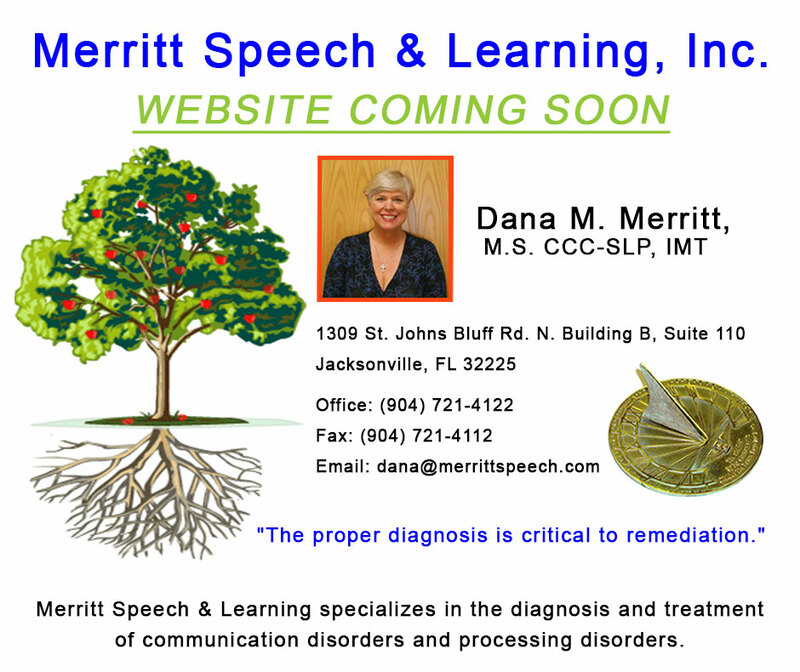 Dana M. Merritt, MS, CCC-SLP, IMT is a graduate of the University of South Florida and has been a Speech-Language Pathologist since 1981. The first half of her career she worked in multidisciplinary settings with adults who suffered from stroke or head injury. She was trained as a Vision Therapist in 1996. She has gained valuable experience from teaching K – 12th grade in a home school setting. She has developed her own phonics program called, “A Time for Phonics.” She is experienced in the differential diagnosis and treatment of communication disorders due to developmental delay. Her expertise is in the diagnosis and treatment of auditory, visual and motor processing disorders. Dana became a certified professional with Scientific Learning for Fast ForWord in March, 1997 and a certified therapist for Interactive Metronome in May, 2003. She is a member of the American Speech-Language-Hearing Association (ASHA), the Florida Speech-Language-Hearing Association (FLASHA), the American Academy of Private Practice in Speech Pathology and Audiology (AAPPSPA), and the Jacksonville Area Speech Pathology Association (JASPA.) Dana has presented at all of these professional organizations and has been invited to speak at other professionals’ conferences and home school conferences. Merritt Speech & Learning, Inc.